You are here: Home / Christmas / Christmas Comes to our Garden! Christmas Comes to our Garden! 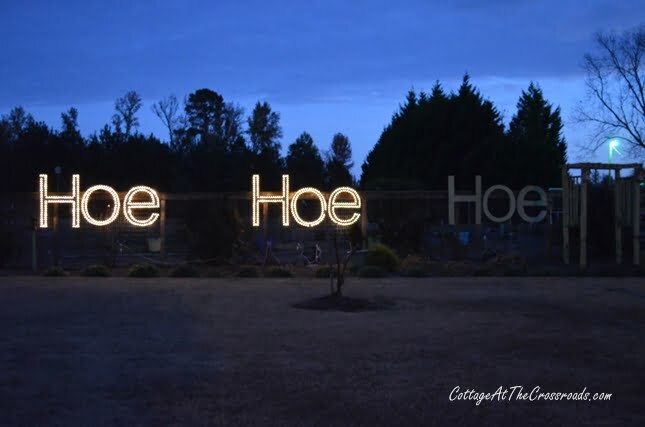 Back in September when I was hoeing the weeds in our garden, Santa Claus came to mind and the idea for the “Hoe Hoe Hoe” sign was born. I ran the idea by Jane, of course, and she loved it. Then I mentioned it to my brother Jim, who is the self-proclaimed “Fix-it” man. 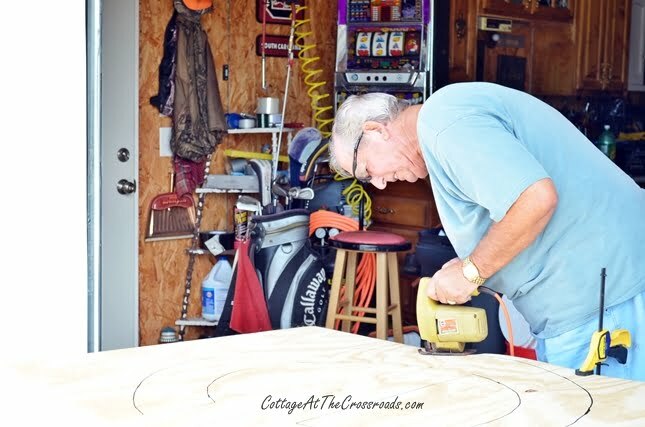 After a little brainstorming about how to make the sign, Jim went by Lowe’s and picked up four sheets of 4’x8′ quarter-inch plywood. 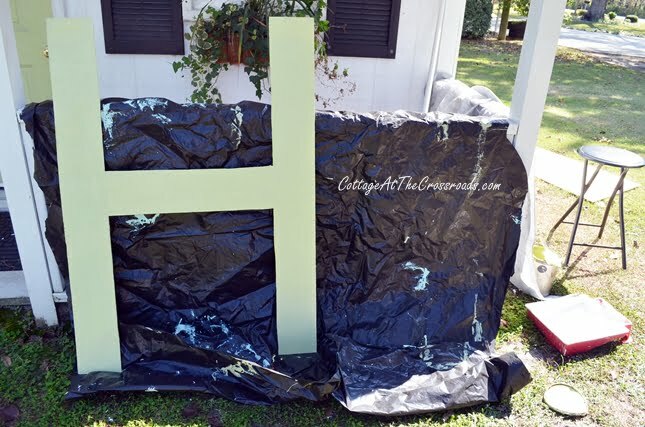 He asked his friend to make some large vinyl letters so he could trace them and cut them out. That’s what he’s doing here with his skill saw. 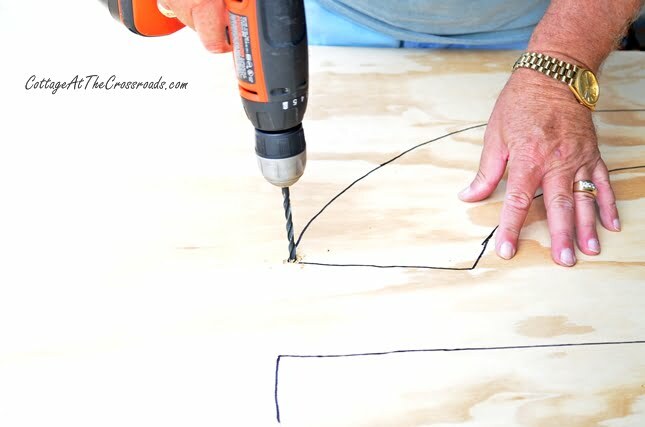 He found it easier to get the skill saw blade started properly by drilling a whole in the corner. We drilled holes two inches apart for the purpose of outlining the letter with lights. I went to the dollar store to purchase some Christmas lights and luckily, they had just put them out. (It was early October!) The first letter was a test to make sure it was going to look good. Jim seemed happy so the project moved forward. 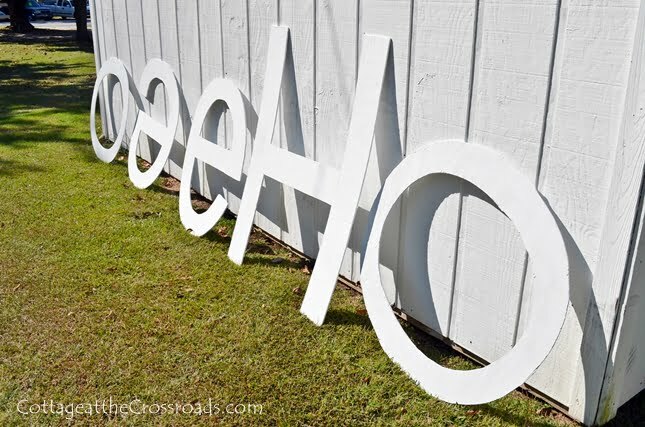 Jane and I primed the letters with white paint. And we finished off the front of each letter with this green paint that we’ve used on several outdoor pieces around our property. 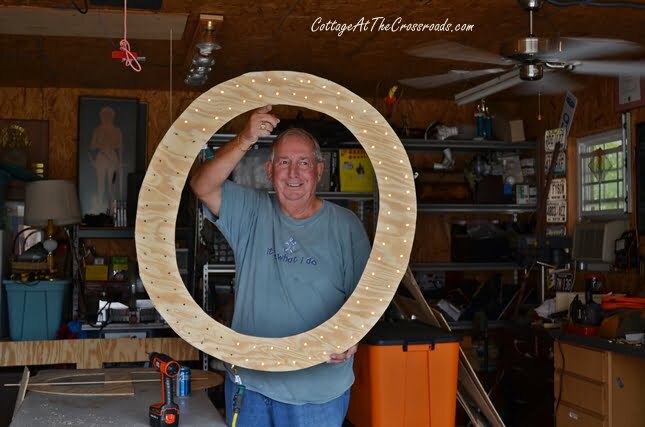 Jim spent a few more weeks drilling the holes and inserting the lights. It wasn’t easy because every bulb had to be hot-glued in the hole to stay in place. There are between 100 and 130 lights on every letter. This was tedious work, to say the least.Sometimes we wondered if it was worth the effort! After all the letters were spaced properly and hung, we plugged the lights into a 3 channel light controller. It was dusk, so while we waited on darkness to fall, we enjoyed a celebratory glass of wine. When nighttime came, we were all completely satisfied with the outcome. 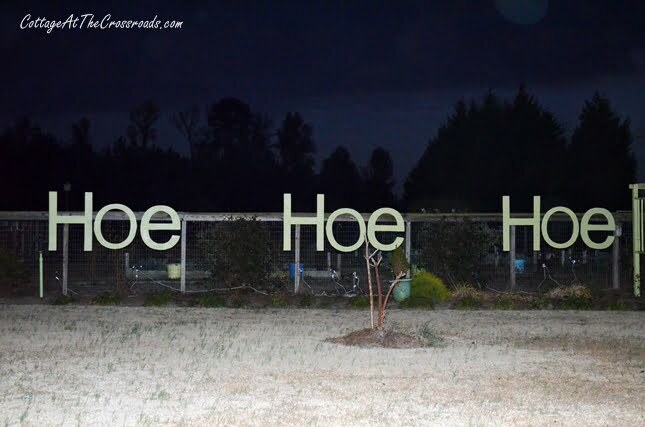 In our garden, it’s HOE, HOE, HOE! Get it? I guess it was worth the effort since Jim did most of the work. Click on the video to see what it looks like at night! Let me be the first to wish you Merry Christmas! How cute, and appropriate! I love it! LOVE IT!!!! I may have to take a ride down just to see it!!!!! Love it! So perfect for your sweet cottage! What a cleaver idea, wish you husband lived near me…ya’ll coming to St. Louis any time soon?!!!! Oh my goodness – I LOVE it!! That is the cutest thing!!! I might need to drive to S Carolina to see this!!! Not sure what possessed you to think about Christmas in September, while hoeing no less, but the end result is so stinkin’ cool! I love it! It’s so original, too! Great job! Very cute! So much work but it looks great! We all need a Jim in our life. These are fabulous! And so clever and perfect for a garden. I’ll be pinning and sharing this. It’s one of the most creative displays I’ve seen. Wow, send him over our way and make us one. It is beautiful and he did a great job. Greetings from Charleston. Can not wait to get back to the crossroads to see this. In this day of weedeaters and herbicides, not many people know what it is to use a “hoe.” I’m sure that your beautiful and productive garden has required the use of that tool often. 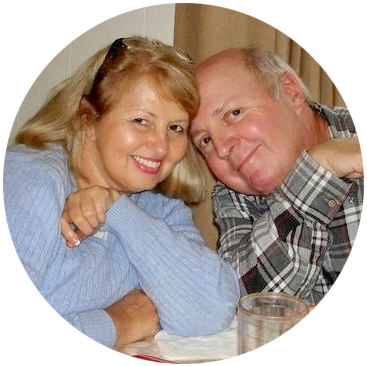 Love your creativity and the Windhams at the Crossroads!